Liu, Y., Hu, B. and Chu, C. (2016). 15N-nitrate Uptake Activity and Root-to-shoot Transport Assay in Rice. Bio-protocol 6(16): e1897. DOI: 10.21769/BioProtoc.1897. 15N is a nonradioactive heavy isotope of nitrogen, widely used for biochemical and physiological research in plants. For instance, 15N-KNO3 was used as the nitrogen source in plants in order to investigate nitrate uptake activity and transport from roots to shoots (Lin et al., 2008). Here, we describe a detailed pipeline used for labeling living rice (Oryza sativa) plants with 15N-KNO3 and determination of net nitrate uptake and transport activity, and this protocol was proved to be valid in Arabidopsis and rice (Lin et al., 2008; Hu et al., 2015). Rice seeds are surface-sterilized with 2.5% sodium hypochlorite (NaClO) for 30 min and then soaked in tap water, put in an incubator chamber at 37 °C for 2 days (d), change water every 12 h till the seeds germinate. Uniformly germinated seeds are selected and put into 96-well plates, then transferred to clear water until roots length reach 3 cm, after which transplant the seeds to modified Kimura B solution. Rice seedlings are grown in a growth chamber with a 12-h light (30 °C)/12-h dark (28 °C) photoperiod and 70% humidity for about 2 weeks. The solution is changed every day. After 2-week cultivation, rice seedlings are pretreated with modified Kimura B solution for 2 h, after which the rice roots are washed by tap water twice and rice seedlings are transferred to modified Kimura B solution containing 5 mM 15N-KNO3 for 3 h.
After 3 h absorption, rice roots are rinsed with 0.1 mM CaSO4 for 2 min to remove the 15N-NO3- on the root surface, then roots and shoots are harvested separately and dried at 70 °C to constant weight in paper bags. Dried samples are ground to fine powder in mortars for subsequent assay. About 0.5 mg dried powder is analyzed by isotope ratio mass spectrometer and the data of 15N content are obtained (Brand, 1996). While detecting the 15N-nitrate uptake activity, a formula [total 15N amount of whole plant (TN)/dry weight (DW) of root (DWR)/3 h] is applied to the calculation, i.e., the amount of 15N take up per unit weight of roots per unit time, total 15N amount of whole plant is derived from the sum of N amount of shoots and roots. The ratio of shoot 15N content (SN) to root 15N content (RN) is used to represent the root-to-shoot transport activity (the higher the value, the higher root-to-shoot transport activity). Figure 1. A 96-well plate that was cut off the bottom well-suited for the growth of rice seedlings. 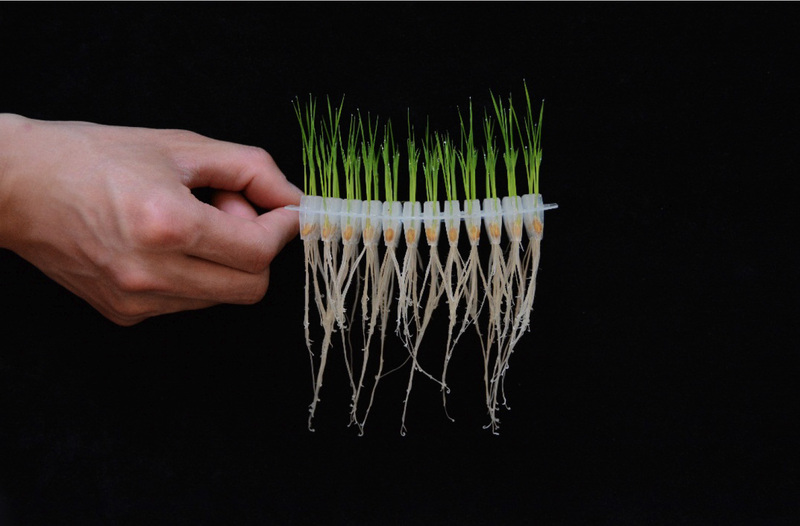 After being put into the 96-well plate, rice roots could grow downward into solution underneath while rice shoots could grow upward tidily along each well. Figure 2. 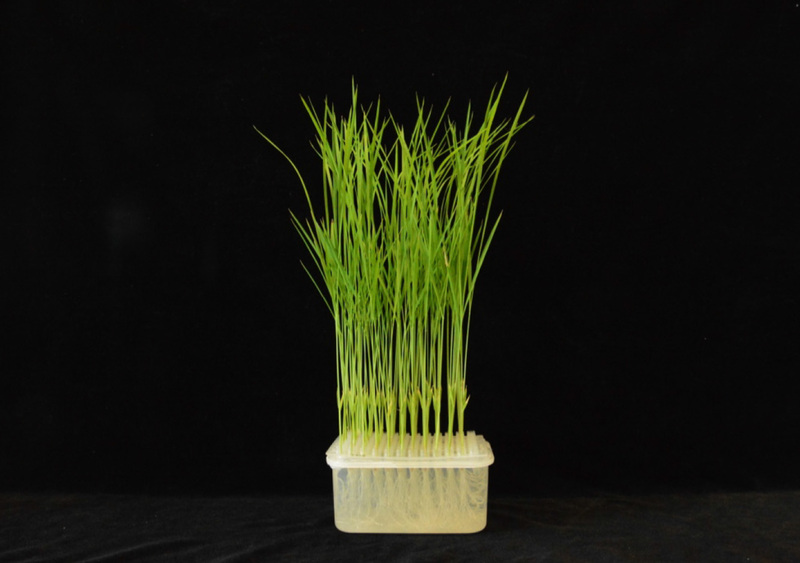 10-day-old rice seedlings grown on a 96-well plate. The container under the 96-well plate is full of modified Kimura B solution, usually the container is wrapped with light-tight material (e.g., tinfoil) to protect rice roots from light. Uniformly germinated seeds were selected to make sure the same growing status of different lines. The germinated seeds could be transferred to modified Kimura B solution until seminal root length was about 3 to 5 cm. The aim of pretreating rice seedlings with modified Kimura B solution for 2 h is to make sure the rice seedlings could get back to a relatively normal physiological state before the 15N-nitrate uptake assay. As mentioned in Procedure 3, 5 mM 15N-KNO3 was used to replace 5 mM KNO3 in modified Kimura B solution while other ingredients remain unchanged. The hydroponic culture has been illuminated in Lin et al. (2008) and Hu et al. (2015), the 15N-nitrate uptake activity and root-to-shoot transport activity assay was cited from Hu et al. (2015). This work was supported by grants from the Ministry of Science and Technology of China (2014AA10A602-5, 2015CB755702), and the Chinese Academy of Sciences (XDA08010400). Brand, W. A. (1996). High precision isotope ratio monitoring techniques in mass spectrometry. Journal of Mass Spectrometry 31:225-235. Delhon, P., Gojon, A., Tillard, P. and Passama, L. (1995). Diurnal regulation of NO3- uptake in soybean plants I. changes in NO3- influx, efflux, and N utilization in the plant during the day-night cycle. Journal of Experimental Botany 46(291): 1585-1594. Hu, B., Wang, W., Ou, S. J., Tang, J. Y., Li, H., Che, R. H., Zhang, Z. H., Chai, X. Y., Wang, H. R., Wang, Y. Q., Liang, C. Z., Liu, L. C., Piao, Z. Z., Deng, Q. Y., Deng, K., Xu, C., Liang, Y., Zhang, L. H., Li, L. G. and Chu, C. C. (2015). Variation in NRT1.1B contributes to nitrate-use divergence between rice subspecies. 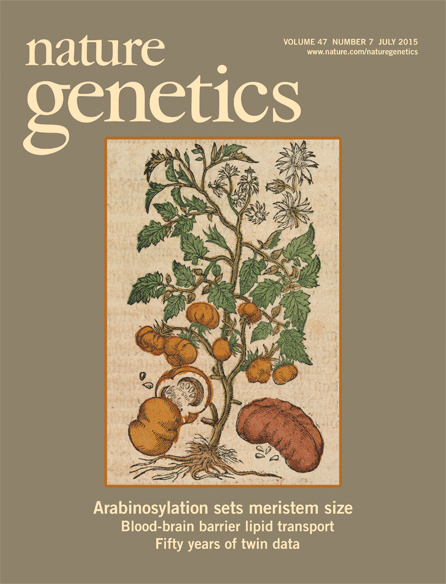 Nature Genetics 47(7): 834-838. Lin, S. H., Kuo, H. F., Canivenc, G., Lin, C. S., Lepetit, M., Hsu, P. K., Tillard, P., Lin, H. L., Wang, Y. Y., Tsai, C. B., Gojon, A. and Tsay, Y. F. (2008). Mutation of the Arabidopsis NRT1.5 nitrate transporter causes defective root-to-shoot nitrate transport. Plant Cell 20(9): 2514-2528. How to cite: Liu, Y., Hu, B. and Chu, C. (2016). 15N-nitrate Uptake Activity and Root-to-shoot Transport Assay in Rice. Bio-protocol 6(16): e1897. DOI: 10.21769/BioProtoc.1897.